When I was 13 years old I started collecting Coca-Cola paraphernalia. I went to camp one year and come home with a huge, metal Coca-Cola window sign rolled up in my sleeping bag (it took me a long time to figure out how to get it home). Every time someone I know leaves the country I make them promise to bring me back a Coke bottle to add to my collection (I have over 30). Whenever it’s Christmas, or I have a birthday you can bet that there will be some tribute to Coca-Cola…and the sad part is, I hardly ever drink the stuff! Needless to say, my kitchen has become a shrine for all of my Coca-Cola tchotchke. (you can thank my mom for that awesome word. Use it as often as possible; it’s one of those “feel good” words) Although some if it is unique and eccentric, a lot of it is just tchotchke. Instead of using real canisters on my counter to hold sugar and flour, I have metal tin Coca-Cola cans lined with plastic bags which are cute but not very, well…sophisticated. 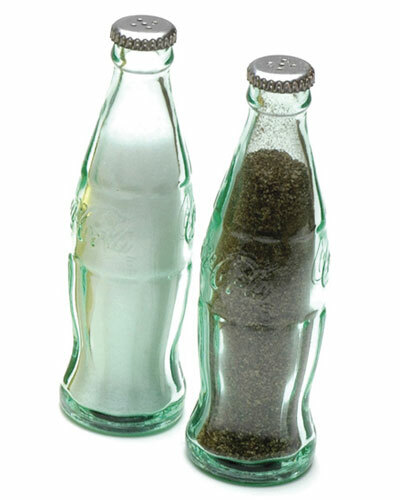 So, it is with great sorrow that I will pass along some of my most treasured kitchen items (salt and pepper shakers in the form of Coke bottles, awesome, right?) and some other crazy stuff I have collected in exchange for a new style. This reminds me of the time that I bought my first pair of red pumps to wear to a school during my undergraduate studies. We were supposed to dress all nice when we went to observe teachers in action so I bought this pair of cheap red pumps, and well, I was hooked on high heels. From then on I loved a good pair of heels matched with an even better outfit. How does this relate to the kitchen? Well I bought this, um, thing to hold spaghetti in and it does not match the Coca-Cola stuff AT ALL, but I loved it. And now I am hooked on this new style. My only concern is which will end up being more expensive, the kitchen or the closet full of heels…. p.s. the kitchen redo involves redoing how I make my coffee, so if anyone has a coffee grinder and a French Press that they are not using, send them my way! 2 Responses to Pause. Refresh. so what is your new style…..? um, something a little more sophisticated, not really sure how to term it….not modern, contemporary maybe?